Uniforms for the 2016 season will be supplied by our official team supplier, Adidas and Soccer Pro. There will be NEW uniforms for 2016 and all players on all teams are required to purchase the new uniforms. We are usually on a 2-3 year cycle for uniforms. 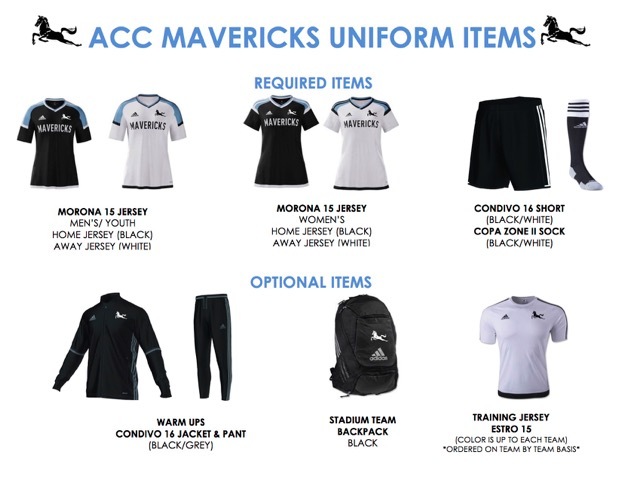 No other colors are accepted as part of the official uniform for the Mavericks (no exceptions). Training t-shirts and other gear are also available . Soccer Pro is next to Office Depot off of Gilman and 10th in Berkeley. Soccer Pro and Adidas are Mavericks Soccer Club official partners. Mavericks SC players will receive a club discount at Soccer Pro - 20% discount on apparel and accessories and a 10% discount on footwear.